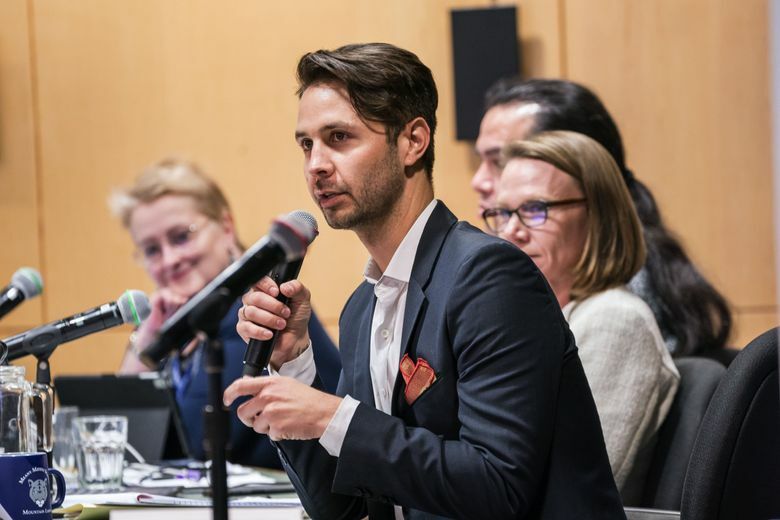 In 2017, Zachary DeWolf ran for the Seattle School Board on the message that he would fight for the city’s most vulnerable students. But Tuesday — less than halfway into his term — he announced that he will join this year’s crowded City Council election, challenging incumbent Kshama Sawant for the seat representing District 3. It comprises roughly the same Central District and Capitol Hill area he currently represents. Outside Tougo Coffee, the Yesler Terrace cafe where he announced his campaign, DeWolf — who works as a program manager for All Home, King County’s coordinating agency for homelessness — spoke of a “deep urgency” to work on the affordable-housing and transportation problems faced by the students and families he represents. If his campaign is successful, DeWolf’s departure could mark even more potential change for the School Board. Four of seven seats are up for reelection this November. Member Jill Geary said this year that she will not seek another term. The process for filling DeWolf’s role, should he win, is unclear. As of Tuesday evening, the district’s legal department did not have an answer. The creation of another open seat could also affect the board’s average level of experience. With the exception of Betty Patu, who has occupied her seat since 2009, all board members are serving their first terms. The news of DeWolf’s campaign comes at a time of financial upheaval, another round of teacher-contract negotiations and the beginning years of a superintendent he helped select. Stephan Blanford, who served in DeWolf’s seat from 2013 to 2017, said he was disappointed to see DeWolf make the announcement so early in his term. DeWolf, a citizen of the Chippewa Cree Nation and the board’s first openly gay member, said his initial goal was to reform the district from the inside to better support marginalized students. Both Burke and board president Leslie Harris said they endorsed his run. “I can attest that he’s worked very hard, and that he’ll stay invested,” said Harris.